MINNEAPOLIS — After getting rattled so many times with runners on base, throwing to first so many times, Clay Buchholz came to a conclusion. He can’t worry when runners get on. That only makes everything harder. So even when he had runners aplenty in his first start of the season Sunday in Kansas City, he did not let them get inside his head. “I think I only picked two times that wasn’t from the dugout,’’ he said. “I got a hold with [Scott] Podsednik on first and held the ball for probably six, seven seconds, and stepped off. Podsednik did, in fact, steal two bases, but the more worrisome part of the outing was that Buchholz allowed the leadoff runner on base in each of his five innings, and that he struck out just one batter. With Buchholz, there’s always the concern that the mental side of the game will overwhelm him. He has progressed over the years, and is not nearly as susceptible to letting one bad pitch snowball, but there’s still a slight whiff of precariousness around him. “Every time that anybody struggles in the big leagues, it’s a mental thing,’’ Buchholz said. “You wouldn’t be here if you weren’t good enough physically to do all the stuff. “I would say probably 90 percent of the time when I go out there, I feel good enough that if I throw pitches where I want to throw them, we’re going to get outs and they’re going to hit the ball at somebody. It’s definitely all mental. He said he hasn’t thought at all about the extra starter in the minor leagues — Daisuke Matsuzaka — who is working to get back to the majors. That hasn’t increased the pressure. With the rib injury to Jacoby Ellsbury and the neck injury to J.D. Drew, Jeremy Hermida already has started three games and had 10 at-bats. That’s a lot for a Red Sox reserve. But it’s not a lot for someone coming from the National League, where there are more double switches and pinch hitters, more opportunities to get in games. Hermida has done well with the time he has been given. He has four hits in those 10 at-bats, including two doubles and one home run. Hermida is still working out his approach. He said he was too ready the first few days, got loose too many times, before he started to understand the process. There’s still more work to do. “Just try and carry over from spring training, ’cause I was feeling good most of spring training,’’ Hermida said. “I understand what the role is going to be, where you’re in there certain days. Just try to take advantage of it. Though it appeared Manny Delcarmen might have corrected some of his velocity issues in his last outing, Sunday at Kansas City, it might have had something to do with the Kauffman Stadium radar gun. Francona estimated that the gun, which showed Delcarmen as high as 95 miles per hour, was perhaps 2 miles per hour fast. 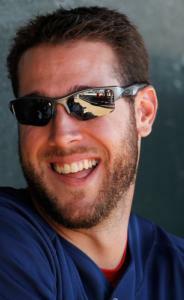 “But I also thought, especially the first inning, I thought he had some good finish on his fastball,’’ Francona said. Delcarmen threw two scoreless innings in the game . . . The BoSox club is offering its 2010 essay contest, in which boys and girls can win a chance to participate in summer baseball and softball camps. Boys ages 9 to 16 can win five days at the Jason Varitek and Dustin Pedroia Summer Baseball Camp presented by the RBI Academy from Aug. 1-6. Girls in grades 5 through 12 can win four days at the Skills and Drills Softball Camp at Wheaton College from July 5-8. Applicants should send a short essay (no more than 100 words) explaining why they would like to attend to camp@bosoxclub.com or BoSox Club Essay Camp Contest, 4 Yawkey Way, Boston 02215. The deadline is June 7.